I love this series. This will be my third time to read through it. For a reason she cannot guess, she has become the target of deadly assassins. Suddenly no place is safe – not even the secret refuge she’s established long ago. Now she must rely on Nicolas Trevane – a dangerous warrior sent to track her down and protect her. Together they generate a scorching heat Dahlia never imagined was possible. But can she trust this man with her secrets – especially when some people would kill to get their hands on them? That caught his attention. He looked up from his papers, the impatience on his face fading to interest. “You’re afraid of her, Milly. She’s four years old and you’re afraid of her. Why?” There was more than scientific interest in his tone. There was eagerness. “She can’t see us through the glass,” Dr. Whitney pointed out. Dahlia turned her head and looked directly at the doctor through the one-way glass. “Why does that man stare at us all the time? What does he want?” She sounded more adult than child and she looked like a young witch with too-old eyes. “He wants to see if you can do anything special,” the nurse answered. “Where does it hurt?” The nurse glanced at the glass too, a small frown beginning to form. 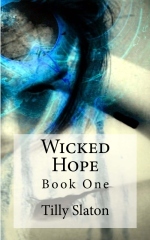 Dahlia sat silent for a moment, still rocking, her fingers curled tightly in the blanket. Behind the one-way glass, Dr. Whitney sucked in his breath and scribbled across the page of his notebook hastily, intrigued by the child’s demeanor. She was clearly weighing the advantages and disadvantages and making a judgment at her young age. Finally she nodded, as if bestowing a great favor on the nurse. There was a small silence. The little girl’s face darkened. Her eyes grew pitch black. She stared fiercely at the glass. “He’s a bad man,” she told the nurse. “A very bad man.” The glass began to fracture into a fine spider’s web. There were at least ten balls of varying size on the floor near the child. All of them began to spin madly in the air before slamming again and again against the window. Glass fragments broke off and rained onto the floor. Chips flew wildly in the air, choking the space until it appeared to be snowing glass. The nurse screamed and ran from the small room, slamming the door behind her. The walls swelled outward with the terrible rage on the child’s face. The door rocked on its hinges. Flames raced up the wall, circled the door jam, bright crackling orange and red, spreading like a storm. Everything that could move was picked up from the floor and spun as if in the center of a tornado. Through it all, Whitney stood watching, mesmerized by the power of the childish tantrum. He didn’t even move when the glass cut his face and blood ran down into the collar of his immaculate shirt. “How could she possibly exist in the outside world without being taught shields?” One of the men sitting in the shadows asked. Lily turned her head to look at him, sighing as she did so. Nicolas Trevane always seemed to be in the shadows and he was one of the GhostWalkers who made her nervous. He sat in such stillness he seemed to blend in with his surroundings, yet when he went into action, he exploded, moving so fast he seemed to blur. He was raised for part of his childhood on a reservation with his father’s people and then spent ten years in Japan with his mother’s people. His face never seemed to give anything away. His black eyes were flat and cold and frightened her almost as much as the fact that he was a sniper, a renowned marksman capable of the most deadly and secret of missions. Ryland bent his head to Lily’s, his chin rubbing the top of her sable hair. “Your father was a brilliant man, Lily. He had to learn about love, it wasn’t shown to him as a child.” It was a refrain he reminded her of often since it had come to light that not only had Dr. Whitney experimented on Lily, removing the filters from her brain in order to enhance psychic ability, but that she wasn’t his biological child as he’d led her to believe, but one of many children he’d ‘bought’ from foreign orphanages. “Before we get too excited, I think you all should watch some of the other training tapes I found. Each of these is labeled Novelty.” She signaled to her husband to press play on the machine to start the video running. Lily found herself holding her breath. She was certain the child Novelty and Dahlia were one and the same. “According to the records, Novelty, is eight years old here.” The child’s hair was thick and as black as a raven’s wing. She wore it carelessly braided and the braid hung to her waist in a thick rope. Her face was delicate, matching the rest of her and the thick hair seemed to overpower her. “I’m certain this is the same child. Look at her face. Her eyes are the same.” Lily felt the child was hiding from the world behind the mass of silken strands. She looked exotic, her origins, Asian. Like all the missing girls, Dr. Whitney had adopted her from a foreign country and brought her to his laboratory to enhance her natural psychic abilities. In the video, the little girl was on a balance beam. She didn’t walk carefully. She didn’t even look down. She ran across it as if it was a wide sidewalk instead of a narrow piece of gymnastics equipment. She didn’t hesitate at the end of the beam, but did a flip off of it, landing on her feet still running without breaking stride. She was far too small to leap up and catch the bars over her head, but she didn’t seem to notice. She launched herself skyward, her hands outstretched, her small body tucked as she connected with the bars and swung over them with ease. “And what we do, isn’t?” Nicolas asked. Lily pointed to the image of the young girl frozen on the screen. “Look at her, she’s laughing, not grabbing her head in pain.” She snapped in another tape. “In this one, she moves locks so fast, at first I thought a machine had to be involved.” The tape showed a huge vault with a complex lock system. The bolts slid so fast, the tumblers spun and clicked as if a large pattern was predetermined. The camera had focused completely on the heavy door so that it wasn’t until they heard a child’s laughter as the door swung open that they even realized Dahlia was there, the one opening locks with her mind. Lily looked so triumphant Ryland hated to crush her joy. “Sweetheart, I’m so excited for you. Really, I am. It’s just that I didn’t understand a damn thing you said.” He looked around the room with a raised eyebrow. The other men shook their heads. “But you don’t think that’s what she’s doing there?” Nicolas asked. “So Dahlia doesn’t do it through sound,” Nicolas said. “You’ve lost me again, Lily,” Ryland said. Nicolas turned his head slowly, looked at her with his cold black eyes. “That’s exactly what she appears to be doing, Lily. Playing with toys. You’re angry with your father and rightly so. But he tried to do for this child what he did for you. Your brain had to work on mathematical problem and patterns all the time, this girl required a different type of work, but she obviously needed it just as much. Why wasn’t she adopted out?” His voice was flat, almost a monotone, but it carried weight and authority. He never raised his voice, but he was always heard. “But you maybe weren’t a natural telepathic. You have other talents that are amazing. When I use telepathy, it doesn’t bother me at all,” Nicolas said. “She’s not armed,” Nicolas pointed out. “No, but she doesn’t need to be,” Lily assured. Ian nodded. “Or curse,” he agreed. Ryland swore and turned away. His gaze collided with Nicolas’. They stared at one another for a long moment of understanding. Watching it made Lily sick. Once her father discovered Dahlia couldn’t work under the conditions they were expecting, he should have pulled her from the training immediately. Unfortunately, she always performed the given task before she collapsed. Remembering the earlier tapes of the stubborn and vengeful child in the laboratory, Lily wondered what they held over her head to get her to work for them when she was so clearly strong willed enough to refuse. Instead of watching the tapes she watched the reactions of the men. She wanted to send the most sympathetic after Dahlia. The woman had suffered trauma for years. She needed the safety of the Whitney home with the protection of the thick walls and a compassionate and kind-hearted staff all of whom had natural barriers so they couldn’t project emotions to the GhostWalker team. Her father had provided the safe house for her and she had, in turn, chosen to share it with the men her father had experimented on. Lily looked at their faces and for the first time felt the urge to laugh. Why had she thought she’d be able to read them? They hid their thoughts behind expressionless masks. They were well trained in the military, each of them receiving special training long before they were ever recruited for duty in the GhostWalker squad. She waited until the last tape had been played and the impact on the men was the most profound. Dahlia Le Blanc was the kind of woman most men would want to protect. Very small, very slight with enormous sad eyes and flawless skin. She looked a doll with her skin and eyes and wealth of jet-black hair. Lily knew Dahlia needed help, a tremendous amount of help, to adjust to living in the world again. She was determined to give Dahlia everything Dr. Whitney had failed to provide. A home, a sanctuary, people she could call family and count on. It wouldn’t be easy to convince Dahlia to come back to the very place where the original damage had been done to her. “I’ll go after her,” Nicolas said suddenly. Unexpectedly. And unwanted. Lily wanted to protest but couldn’t think of reasons to stop him. It annoyed her that she was so transparent that Nicolas could see she was uneasy around him. It wasn’t that she didn’t like him, but he frightened her with his too cold eyes and his implacable resolve. It didn’t help that she knew his expertise. “I thought Gator would know the area better and find it easier.” It was the best excuse she could come up with. Lily knew none of the men would argue with Nicolas. They just never did. And she had no good reason to argue with him. Dahlia would be safe with him. She glanced at Gator in the hopes he’d volunteer to go along. He wasn’t looking at her. Of course, the men would stand solidly behind Nicolas. She sighed and capitulated. “I’ll have Cyrus Bishop draw up the papers giving you the authority to remove her. We know we can trust Cyrus to stay quiet.” Lily had taken her time trusting the family lawyer after learning the extent of her father’s hidden secrets, uncertain just how deeply Cyrus Bishop had been involved. Experimenting on people, especially children was monstrous, yet Peter Whitney had provided her with a loving home life and a wonderful childhood. She was still struggling to understand the two sides of her father. I have to go, Rye. Nicolas indicated the others as he spoke telepathically to insure privacy. It had taken long months of practice to be able to direct telepathic communication to only one subject and keep the others from hearing, but it was a useful tool and Nicolas had worked hard to learn the skill. Lily has them all bleeding in sympathy for this woman. Anyone capable of generating an anti-gravity field or the kind of heat it takes to start a fire and has the ability to change the structure of a cable is dangerous. Every one of the men would hesitate to do whatever was necessary if she turned on them. I won’t. He did. Lily takes on his blame and she shouldn’t. She’s every bit a victim as this poor woman, but none of that changes the danger to anyone trying to persuade Dahlia to leave her only known sanctuary. Don’t you see what they’ve done, Rye? If they’re using her as an operative as Lily suspects, they keep her in line because she needs that home out in the swamp. She has no choice but to return to it. She can’t live outside of that environment so she does what they tell her and returns to it. They wouldn’t even need to watch her, they’d know she’d have to come back. Ryland watched the men laughing and joking with Nicolas. All of them knew Nicolas could be sent out alone into the deepest jungle or the broadest expanse of desert for months and he always returned with the job done. It didn’t matter, they would throw everything they could think of at him and Nicolas would take it all good-naturedly, but in the end, he would leave his team behind. Do your best to reassure Lily. Ryland found it much easier to use telepathy these days. The exercises Lily insisted the men do daily had added, not only to their control, but to reconstructing a semblance of the barriers her father had brought down in his experiment to enhance them all. Lily worked hard at conditioning them, hoping to give them the necessary tools to be able to live in the world with families and friends. In the meantime, she generously shared her home and her time working with them all. It only made him love her more. He wanted Nicolas to find a way to reassure Lily. Nicolas wasn’t the type of man to lie even to make Lily feel better. If it’s at all possible, I’ll bring Dahlia back to her. That’s the best I can do. “He’s capable of killing her,” she protested. This entry was posted in Book of the day and tagged Christine Feehan, Death, dominance, paranormal romance. Bookmark the permalink.